The people of Amaruru community in Orsu Local Government Area of Imo state have again appealed to the Federal and State Governments to urgently repair the bridge crossing the Urasi River located in the area which collapsed about a year ago. The about 50-meter long bridge located at Elugwutokpi village Amaruru in Orsu was said to have been constructed shortly after the nation’s Independence in 1960 and had since then eased movement of goods from the commercial city of Nnewi in Anambra state to the neighbouring Orsu and Orlu Local Government Areas of Imo state. The bridge, it was gathered, collapsed when a truck conveying bags of cement attempted to cross but was unlucky as both the vehicle and goods submerged into the river. Months after visits to the area by officials of both the Imo and Anambra states Governments, the bridge is yet to receive any attention. 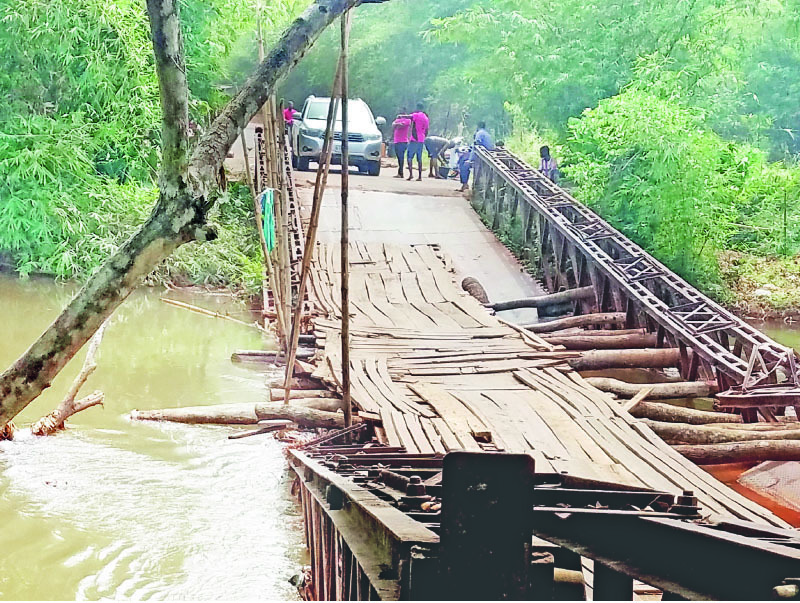 Youths in the area have since resorted to self-help having constructed a makeshift wooden bridge to enable cars, motorcycles and other light weight vehicles cross over either ways as trucks are not permitted. Their intervention is not without cost as motorcycle operators are compelled to pay the sum of one hundred naira while vehicles part with five hundred naira to use the bridge. Daily Sun gathered that the youths were considering a hundred per cent increase in the toll to enable them maintain the facility. One of their leaders who identified himself as Ibe Amatu lamented the plight of his people thus: “For the past seven months; this bridge has been like this, now they are giving us empty promises because election is around the corner. Let them do something quickly because we are part of Imo state too. Since this bridge had problem; a lot of vehicles that bring things from Nnewi no longer pass here except the small cars. “Our youths do not have work to do so we now take advantage of this bridge; we want to use it to make something. We decided to come and make the ‘kpako’ so that we can make it motorable. We want to increase the money to one thousand naira”. Many of the motorists who paid the toll declined to comment on the issue, but Duruiheoma; a commercial motorcycle operator who plies the bridge called for government intervention. “I paid one hundred naira now but it will be for going and coming, these planks which they used in making the bridge at least are manageable. It is somebody that bought them and, I don’t really blame the youths for collecting money before they allow any car or motorcycle to cross over to Nnewi. It is the fault of the state and the federal government which have refused to repair it since its collapse”, he said. Similarly, Idiga Ambrose, a trader said they had expected that by now the Urasi Bridge would have been repaired by the state government to mitigate the suffering of the people of the area. “I thought by now that the state government would have repaired the bridge but over seven months now nothing has been done. We were told that it is a federal bridge but it is not the Federal Government that is using it but the people of Nnewi and Amaruru and therefore it is the responsibility of the governments of Anambra and Imo to repair it”, he said in anger. But the House of Assembly member for Orsu State constituency of Imo State, Mr. Uche Agabiga recounted previous efforts at drawing government’s attention to the bridge. “The condition of the bridge is pitiable; a trailer carrying more than 800 bags of cement sank into the bridge months ago. I made a motion; praying the two Governors to come to the rescue of the people in a way of putting up a preliminary measure to see that people continue to use that bridge. I also called on the Federal Road Maintenance Agency to come and see the situation knowing full well that it is a federal bridge, everyday; it is causing problem; the other day we heard that someone fell inside the water”, the lawmaker narrated. He, however, expressed the optimism that the relevant authorities would soon come to their rescue. Our correspondent who visited the boundary community said that socio-economic activities have been hampered in the area following the collapse of the bridge that served as major gateway to Nnewi in Anambra State.